With Vice President Joe Biden nearly jumping into the 2020 White House race, rumors are buzzing over who he'll choose as his running mate. Former Georgia gubernatorial candidate Stacey Abrams's name keeps popping up. Although Abrams lost to Republican Brian Kemp in November, she is considered a "rising star" in the Democratic Party. For instance, she delivered the Democratic rebuttal to President Trump's State of the Union address in January. An Axios report suggests Biden is seriously eyeing her as his VP. 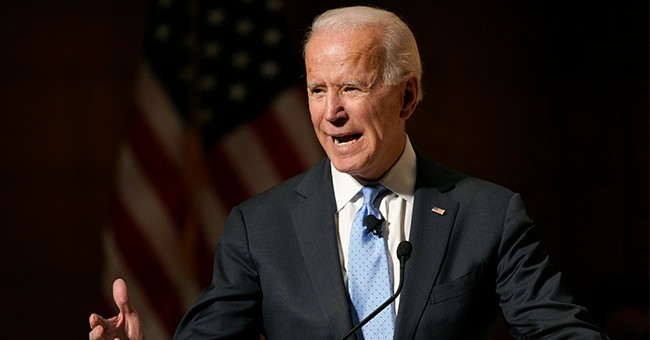 "Abrams’ presence on the ticket could help to even out Biden’s old, white, moderate, image in a party whose energy is increasingly young, diverse, and progressive," according to Vanity Fair. The outlet mused that having 45-year-old Abrams at his side could seriously help Biden's image, not only because he'd be seen as another "old, white man," but because of his troubled role in now Supreme Court Justice Clarence Thomas's confirmation hearings in the 1990s. Biden presided over the hearings as chairman of the Senate Judiciary Committee. As such, he had an opportunity to make Anita Hill's voice heard. Hill had accused Thomas, her old boss, of sexual harassment. Biden allowed Republicans on the panel to criticize Hill and he has admitted that he owes her an apology. "I wish I could've protected her from the attacks that came at her, but I didn't know any way to do that," Biden regretted last January. He added that he was "so sorry" in an interview with Teen Vogue. Hill, however, didn't exactly accept it. "He said, 'I am sorry if she felt she didn’t get a fair hearing,'" she told The Washington Post. "That’s sort of an 'I’m sorry if you were offended.'" Abrams being his running mate could help "paper over concerns about some rough patches in his legacy," Vanity Fair suggested. Yet, this potential presidential ticket could be mutually beneficial. It could also help Abrams, who has entertained the possibility of running for president herself, by putting her next in line for the post, should Biden win. Either way, his experience and popularity among moderate Democrats coupled with her progressive energy could make for a formidable ticket—both in a crowded primary and a tough general election against Trump. There may be something to the rumor, considering Biden met privately with Abrams earlier this month.